"These chocolate martinis are served in martini glasses coated with chocolate syrup and garnished with maraschino cherries. Use the cherries to slowly stir the chocolate syrup into the drink. It is delicious! I served this with a chocolate-bacon bruschetta." Drizzle the chocolate syrup into two martini glasses, start 2/3 of the way up the side of the glass, and let the chocolate run to the bottom; set aside. Place the ice into a cocktail shaker. Pour in the vodka, chocolate liqueur, and creme de cacao. Cover, and shake until the outside of the shaker has frosted. Strain into the prepared martini glasses. Garnish with maraschino cherries to serve. 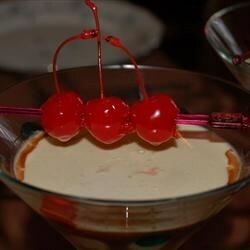 My guests played with the cherries and chocolate as they happily sipped their drinks. I used Pinnacle Chocolate Whipped vodka and it made a wonderful chocolate martini. I didn’t bother with the cherries.